Last night I went to Vespers for the first time in a few months. Vespers at the Orthodox Community of St Andrew here in Edinburgh is always at 6:30. Last time I was there, it was winter. 6:30 in an Edinburgh winter is black, dark night. The chapel is lit by the oil lamps hanging in front of icons and a few lights behind the iconostasis as well as a lamp on the lectern. In May, however, we have yet to reach sunset. Vespers in May in Scotland is bright, sunny. We are still tending towards sundown (wait six weeks for Vespers in broad daylight), but there is a nice, fiery, late evening glow to the light shining in through the windows and playing on the icons, the chandelier, the censer, Father Raphael’s gilt chasuble (not sure if that’s the right word). Shafts of light from this late evening sun illuminate the clouds of incense. It is fitting, in this Easter season, to sing and pray in the light, for Christ is the light of the world. Last night, I was also appointed lector for about 5 minutes. I read out a Psalm and recited, ‘Lord, have mercy,’ several times during some of the prayers. I think Alexander Schmemann said that it takes 46 books to do the whole cycle of Orthodox services. Father Raphael and I were having a bit of difficulty finding where we were meant to be — Feast of Mid-Pentecost along with St Simon the Zealot and Tuesday evening — but Father Avraamy arrived, saved the day and took over as reader. There is a different comfort here from winter, a brighter invitation at the Feast of Mid-Pentecost than in the bleak mid-winter. The little chapel was lit only by ambient light from the sides, the chandelier from the ceiling turned off — this, of course, augmented by the lights on Fr. Raphael’s lectern and the glowing candles in the lamps before the iconostasis and those lit by the faithful before the icons near the door. Icons hung on the four walls of the room as well as on the iconostasis, although not completely covering this piece of ecclesiastical furniture which was made from simple timbers and boards, no fancy carvings in sight. Although the chapel had no dome (I believe Fr. 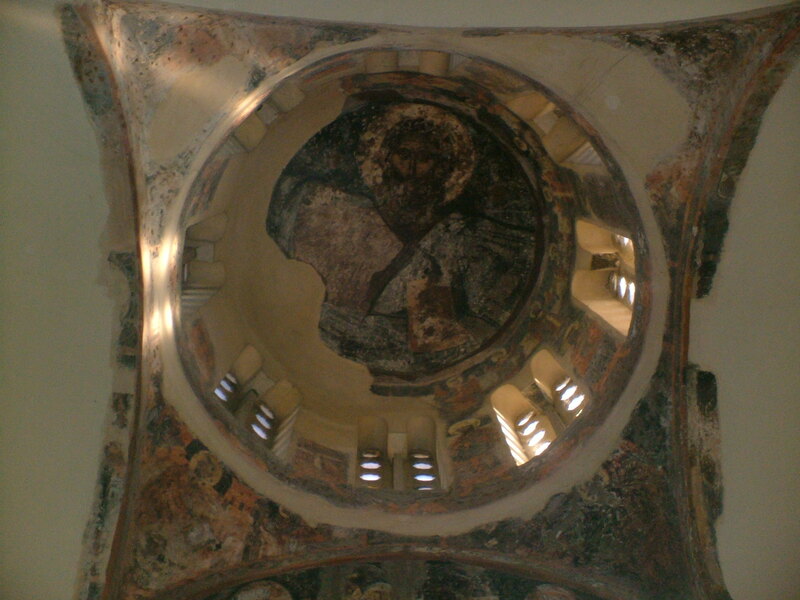 John lives upstairs), a circular icon of Christ Pantokrator was mounted to the ceiling above the nave. When the curtain in the iconostasis opened, I could see the Holy Table* with an ornate cross with two other ornate objects flanking it; they reminded me of monstrances, but I knew they couldn’t be since Benediction of the Blessed Sacrament is a western phenomenon associated with the 13th-century feast of Corpus Christi. Fr. Raphael stood at his lectern in the back left corner of the chapel and chanted and sang Vespers. There were Psalms, the Lord’s Prayer, Kyries, and many others. Amidst these beautiful hymns and chants were hymns for St. Ambrose of Milan whose feast was the next day. These were beautiful and complex, verse homilies in miniature, teaching us of the life and teachings of St. Ambrose, praying that our faith might mirror his. My Sundays of worship at Evensong at St. Alban’s in Ottawa as well as the many nights I have prayed Compline alone gladdened my heart when Fr. Raphael sang the Nunc Dimittis. I mouthed the words silently along with him. Every once in a while, I would see Fr. John behind the iconostasis, standing before the Holy Table, bowing, praying, and chanting a few portions of the order for Vespers himself. At one point, Fr. John censed the Holy Table and then proceed out from behind the iconostasis with the censer. He censed the doors, the icons of the day posted near the doors, Theodore, me, and Fr. Raphael, before proceeding back to his position behind the iconostasis. Theodore, a young Romanian student of electrical engineering at the University of Edinburgh, and I were the only two congregants for most of Vespers last night. We stood at the back, crossing ourselves at the right moments and lifting up our hearts to God. Using skills developed at Roman Catholic and Anglo-Catholic services, I kept half an eye on Fr. Raphael to know when to cross myself. I tried to listen to the words of the service, but sometimes, especially when the chanting became singing, I got caught up in the melody and lost track of the words. I prayed the Jesus Prayer (‘Lord Jesus Christ, Son of God, have mercy on me, a sinner’) many times over. My charismatic upbringing also manifested itself in the quiet praying in tongues through the movement of the Holy Spirit in that quiet, holy space. At times, my mind wandered as I stood there, thinking about Eastern Orthodoxy, liturgy, and worship, as well as St. Ambrose. Inevitably, my thoughts turned to the fact that my back was hurting. I sat down. Theodore had already done so, so I didn’t feel bad about it. Within about a minute of having sat down, Fr. Raphael called me over to his four-platformed spinning lectern to read. I read the Trisagion, the Lord’s Prayer, a prayer to St. Ambrose, and a prayer to the Blessed Virgin Mary. I may have prayed something else, but those are the prayers that stand out in my mind. 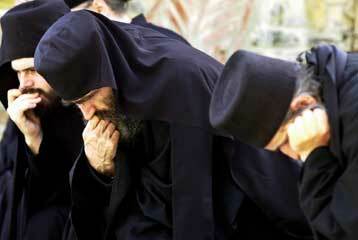 Fortunately, I know enough of Orthodox liturgy to have been able to pray the Glory Be without printed words properly. After this beautiful service, we retired to the church hall for tea and cake. I met Theodore and Dimitri, and had a conversation with Fr. Raphael about Pope St. Leo the Great and St. Cyril of Alexandria. Then, as it was about 8:15 and I hadn’t had supper, I went home. I’m glad I stopped in at the Orthodox Community of St. Andrew the Apostle. The Lord blessed me through that visit, and I worshipped him in spirit and in truth. *If I recall Fr. Alexander Schmemann properly, the entire space involved in the iconostasis is the altar. Not knowing the Orthodox word, I give you the Anglican.